UVM Morgan Horse Farm visitors enjoy demonstrations with horses at Vermont Day. Colonel Joseph Battell probably never imagined in the late 1870’s that the future of his Weybridge, VT, farm would include a pasture of award-winning UVM bred Morgan horses, student apprentices, and visitors from all over the world. Yet, almost 150 years after he launched his passion for preserving and promoting America’s first breed of horse, the University of Vermont Morgan Horse Farm is stronger than ever, and launching its own plans for the future. A short drive down a country road about 40 minutes from the UVM campus, lined with pastures on each side, you will find the UVM Morgan Horse Farm. The barns, which are designated on the National Register of Historic Places, are centered by the majestic statue of “Figure” the foundation sire of the Morgan breed. The facility is headquarters for the coveted genetic lineage of the Battell/US Government Morgans, which played a key role in Vermont history and the development of the Morgan breed. The University of Vermont has been the steward of this important site and herd since the mid-1950’s, and now UVM Morgans help represent the official Vermont state animal. For the past three decades, the farm has been directed by Stephen Davis, of Weybridge, who bred, trained, and showed UVM Morgans throughout New England. Steve retired from his position this year, but his knowledge of Morgans, shared with countless numbers of Morgan enthusiasts, horse owners and student apprentices, will continue to be a thread in the fabric of the Vermont horse industry for many years to come. The UVM College of Agriculture and Life Sciences is proud to announce the new leadership team at the UVM Morgan Horse Farm. Together, this team, with the support from the college and University, will provide new learning opportunities for students, and increase engagement with horse owners, visitors, and the local community. 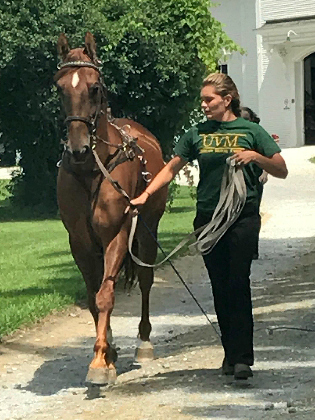 Sarah Fauver, Equine Specialist, will oversee the day-to-day management and assist with training of the UVM Morgans in partnership with students and apprentices. She served as a former apprentice intern on the farm and is a graduate of the UVM Animal & Veterinary Sciences program in the College of Agriculture and Life Sciences. Margot Smithson, Operations Coordinator, will coordinate communication and outreach, oversee tourism and business management. An amateur horse enthusiast, Margot is a graduate of St. Lawrence University and comes to this position with an administrative and management background in the human services field. The team is administered by interim faculty coordinator, David Townson, Chair of the Department of Animal & Veterinary Sciences, and Stephanie Dion, Assistant Dean of Business Operations, College of Agriculture and Life Sciences. If you are interested in supporting the UVM Morgan Horse Farm, stop by or contact Margot Smithson at 802-388-2011 or email uvm.morgans@uvm.edu. 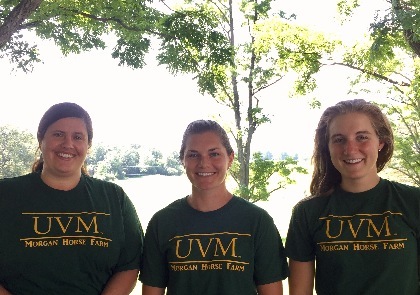 New UVM Morgan Farm leadership, from left: Margot Smithson, Operations Coordinator, Kimberly Demars, Farm Manager, and Sarah Fauver, Equine Specialist.